A favorite chill-chaser, especially popular during the winter, is a steaming cup of Irish coffee. During our visit to the Republic of Ireland last summer we learned how this drink came to be—and how to prepare it ourselves. In addition to helping the war effort through new air strategies, planes were available for people who could afford the $5000 one-way price tag. Primarily the rich and famous were the only ones able to make the 16-hour flight across the ocean. On October 14, 1943 an American couple arrived early morning after a storm and needed a coffee boost to warm them up. Joe Sherridan, the chef serving drinks at the terminal, added Power’s whiskey and brown sugar to freshly brewed cups of coffee. He topped this with lightly whipped cream dribbled over the back side of a warm spoon to look like foam on pint of Guiness beer. 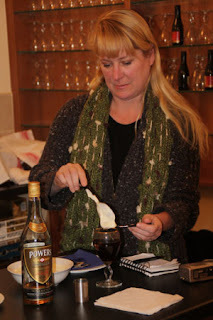 The technique takes a bit of practice, but the drink proved immensely popular, and we still enjoy the kick of Irish coffee. 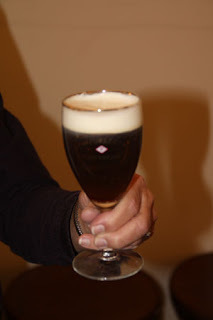 Of course since it's "Irish" Coffee, there are many conflicting stories about the origin of this great invention. Many people go with the claim of the famous San Francisco bar, the Buena Vista Cafe, to have been the originator of Irish Coffee. That's not farfetched, because thirty years ago, when Irish Coffee was well established in the U.S., most residents of Ireland had never heard of it. And remember that corned beef and cabbage, which everyone in America associates with the Irish, is virtually unknown in Ireland. The Foyne story is perhaps the origin of another claim, that Irish Coffee was invented at the Shannon airport bar.